The Domhnach Airgid—or Silver Church—is a splendid exercise in mediaeval retro. It is not just an antique; it is a very deliberate display of selfconscious antiquity. One of the reasons the Anglo-Normans represented a far more potent threat to the established order in Ireland than the Vikings had ever done is that these newcomers were enormously interested in controlling the Irish church. The reform of a supposedly decadent Irish Christianity was a key ideological justification for the Anglo-Norman invasion. This also justified the supplanting of native by foreign abbots and bishops. Long before the coming of the Anglo-Normans, however, the Irish church was in touch with the reforming movements of European Christianity. The reorganisation of the Irish church into territorial dioceses on the continental model was likewise undertaken before the Anglo-Norman invasion. The great continental monastic orders were already established in Ireland, notably at the Cistercian abbey of Mellifont, which had been founded in 1142 by monks from Clairvaux. The newcomers nevertheless had a huge impact on the church in Ireland. They brought—in tandem with their establishment of lordly manors—the system of parishes that has had such a profound impact on the Irish sense of belonging. They encouraged the rapid expansion of the Cistercians, Benedictines and Augustinians, as well as the introduction of new orders such as the Templars and Hospitallers. This influx created a direct challenge to the authority of native bishops, not least when, in 1217, it was decreed that, as ‘the peace of Ireland has been frequently disturbed by elections of Irishmen’ as bishops, none should be consecrated in future—a move denounced by the pope as an ‘unheard of audacity’. Part of the fightback by the native clerical aristocracy can be seen in a rash of elaborate refurbishments of ancient sacred objects associated, especially, with the founder of the Irish church, St Patrick. 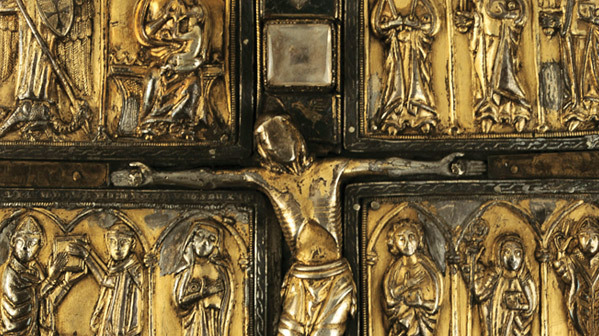 The Domhnach Airgid was made to enclose a miscellany of relics. Traditionally, the shrine was claimed to be that given by St Patrick himself to his companion St Macartan, making it an object of great veneration. Around 1350, the abbot of Clones, Co. Monaghan, John O Carbry, commissioned a substantial remodelling of the Domhnach Airgid. This remodelling brings the ancient relic up to date, in the international gothic style. It fuses contemporary feudal ideals with an insistence on the validity of indigenous traditions: native saints (Macartan, Patrick, Brigid, Columba) take their place alongside some late-mediaeval newcomers (Catherine of Alexandria, James the Great and John the Baptist in tandem with Salome). Already, an object from the distant Irish past is being used to make a contemporary political point.